Shampooches Southend is a Professional Dog Grooming Salon in Southend where you and your dog will always receive a warm welcome. 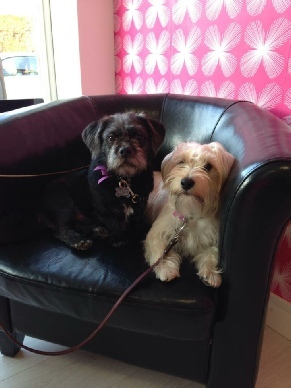 Pop in or call us on 07476 992 900 to discuss your dog’s grooming needs and to make an appointment. Your dog is our top priority and will be pampered on a one to one basis, will not be caged and be treated as though one of our own. We will provide safe handling in a bright, clean and secure environment where grooming is done at a speed your dog is happy with allowing rests if needed so every visit is a happy and pleasant experience. Your dog’s introduction to the groomer is important for the groomer/dog relationship so we aim to make sure that your dogs groomer is their new best friend. Grooms will be booked according to the speed that your dog’s coat grows as regular grooms will help reduce excess hair shedding and vacuuming! Your dog’s health is important and all breeds benefit from a healthy, hygienic skin and coat. dead coat whilst improving the coat texture and preparing your dogs coat for clipping. De Matting if required can be done by hand using a process of grooming tools but if badly matted may need shaving, this will all be discussed with you prior to the grooming.